A baggage handler loading my boxed bike (and half my gear) at the BWI airport, en-route home. I haven't yet opened the box to survey the damage. Tomorrow is soon enough. 4 May 2011. I have mixed emotions as I’m winging my way home. Flying into Jackson, Mississippi, on the first leg of this Southwest flight, I looked down at the dense green vegetation and the rain-swollen rivers and had some pangs of regret that I didn’t get into Louisiana or the truly lush green of the Delta Country. A few of the roads I could see wending their way along creeks and bayous looked pretty inviting. And, as noted yesterday, I was also disappointed not to end my trip on a train—that would have been a great way to decompress after a month-and-a-half of biking. But I am also very happy to be heading home to Vermont—to Jerelyn and our golden retriever, Roxy, and the many friends who have sent such good wishes to me on this adventure. Spring has sprung in Vermont, and I can’t wait to see our forsythia in bloom and our redbud in bud. 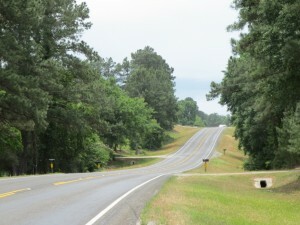 FM 1774 heading towards Houston. This almost looks like the Northeast here! Click on any image to enlarge. 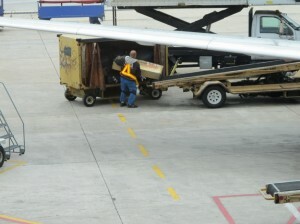 3 May 2011 (posted the next day—from the Hobby Airport in Houston). The ride yesterday from Navasota to Houston was physically pretty easy. While I covered 72 miles, I had a nice tailbreeze out of the north most of the day and—more significantly—the weather turned, so the humidity was much lower. There were threatening clouds (locals might refer to these as “teasing” clouds), but no rain. What was hard about today’s ride was the level of concentration required relative to traffic. I was off the Adventure Cycling route and making it up as I made my way toward Houston. I took 105 east for about 15 or 20 miles, then turned south on FM 1994 (FM for “Farm to Market—which is kind-of cool). Route 105 had a good shoulder, but quite a bit of fast traffic; 1774 had somewhat less traffic, but no shoulder. 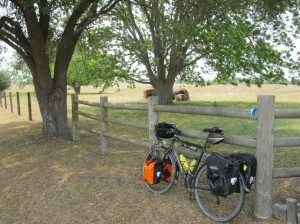 One of my many rest stops--under some spreading live oak trees. Note that my tent is gone from my bike; I sent it back home from Austin. 1 May 2011 (posted two days later–I’ve had trouble getting good Internet connections, and I’ve spent an inordinate amount of dealing with return-travel hassles, which I’ll describe in the next blog). This biking was supposed to get easier as my aging muscles attune to the workout. It didn’t seem that way today! I biked 78 miles to Navasota, Texas, which is northwest of Houston. Tomorrow, I’ll head down toward Houston and the terminus of this biking journey. Heading out of LaGrange, after a nice stay with Brad Cutright and his daughter, I took a slightly longer route Brad had showed me that would be free of traffic. It was largely free of traffic, and even though it was Sunday, I’m sure the lower traffic warranted the extra five or six miles. 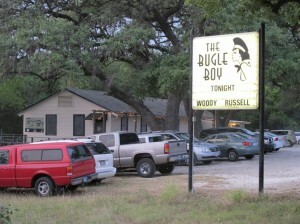 The Bugle Boy “listening room” in La Grange, Texas. Amazing place! Click on any image to enlarge. 30 April 2011 (posted the next evening). As I write this I’m in a place called The Bugle Boy in La Grange, Texas. It’s a “listening room” operated as a nonprofit organization. A wide range of musician’s play here; tonight is Woody Russell, a bluesman extraordinaire. The place is run by Lane Gosnay, who is a good friend of Kim Miller and Alex Long. When I mentioned to Kim and Alex that my plan was to head to La Grange today, they immediately suggested that I should get to the Bugle Boy if at all possible. In fact, they called Lane to let her know that I’d be coming through town and see if she might have a place to put me up.